Lothon, M.; Lohou, F.; Durand, P.; Couvreux, F.; Hartogensis, O.; Legain, D.; Pardyjak, E.; Pino, D.; Reuder, J.; Vilà-Guerau de Arellano, J. Growth of the CBL over land in the middle of the day has been extensively observed and relatively successfully modeled. However the late afternoon transition (LAT), like the morning transition, is difficult to observe and model due to turbulence intermittency and anisotropy, horizontal heterogeneity, and rapid time changes. There is a striking paucity of observations of the turbulence decay within the CBL, as well as a lack of realistic modeling studies. This motivated the Boundary Layer Late Afternoon and Sunset Turbulence (BLLAST) 2011 field experiment, which aimed at enhancing observations of the LAT, so as to better understand the physical processes that control it, and elucidate the role of the LAT on mesoscale and turbulence scale motions, and on species transport. Lothon, M. [et al.]. The Boundary Layer Late Afternoon and Sunset Turbulence 2011 field experiment (BLT). A: Symposium on Boundary Layers and Turbulence. 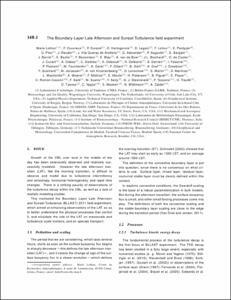 "Proceedings of the 20th Symposium on Boundary Layers and Turbulence: 9-13 July 2012, Boston, MA". Boston: 2012.